I am astounded, amazed and in awe of the genious of Ferran Adria, head chef of El Bulli. Last night I went to a lecture at the State Theatre in Sydney where he gave a talk, to launch his book. The stunning video presentations of the intricacy of his art blew everyone away. And it’s astonishing that when set to music – you can truly see how food moves him and now us. What would a trip to New York be without a trip to the famous Carrie Bradshaw hang out, The Magnolia Bakery? (Sorry, I can’t type the name of the show – SATC -here lest I hit some unsavoury weblinks. You know what I mean!). It’s in a very quiet street near Chelsea – kinda hard to find. The shop is actually very unpretentious, with its chequered tiled floor, rustic feel and young urban staff. The cupcakes sit in melamine boxes and you help yourself. At US$1.75 each, it’s a very guilt free treat (well, on the hip pocket that is!). Choose from chocolate or vanilla cupcakes with various sprinkles and 2cm thick layer of icing (not for the calorie conscious!!). You need to pre-order if you’re going to buy more than a dozen – but the best part is that you can choose your decorations! If cupcakes aren’t to your liking; they also serve other desserts including cherry slice, banana bread; and coffee. There is only 1 little table though, so plan to take out. There’s a small park nearby where you can gobble up your cupcake without being watched by everyone! I just actually bought the cookbook from the Magnolia Bakery from Amazon. It’s got the recipe for those famous cupcakes, as well as many other delectable traditional baked favourites such as peanut butter fudge cheesecake squares…. better hit the treadmill! This recipe is from my friend Jo. It’s also something that can be prepared the night before for lunch. 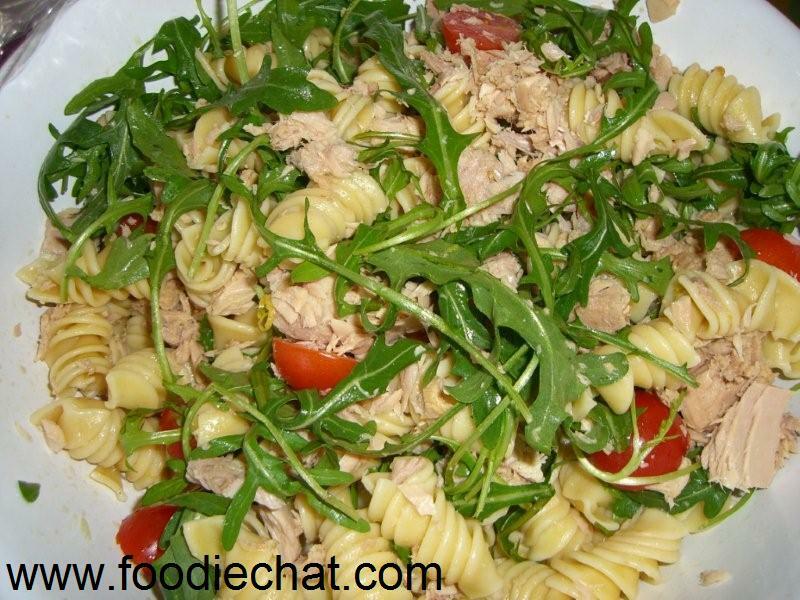 Take 1 cup of cooked spiralli pasta (I use wholemeal as it’s lower GI), a few halved cherry tomatoes, some sliced capsicum, and a few rocket leaves, and make a dressing of 1 teaspoon lemon juice, and 1.5 teaspoons of extra virgin olive oil. Season to taste, and add a can of drained tuna in olive oil. If you’re taking it to work, dress everything except the rocket, and place the rocket on the top of your lunchbox, and keep the tuna separate. Low GI, high protein lunch – easy! You are currently browsing the FoodieChat weblog archives for October, 2008.